I back in Saint Bartholomew’s Church, Ballsbridge, at mid-day today, presiding at the mid-week Eucharist. Earlier this week, I was discussing Saint Bartholomew’s Church and its unique place in the traditions of liturgy, music, architecture and Victorian decoration in the Church of Ireland. The architect Thomas Henry Wyatt (1807-1880) probably received the commission because he enjoyed the patronage of the Herbert family who were the landlords of this part of Dublin, and who, as Earls of Pembroke, were to give their name to a new township based on Ballsbridge. Wyatt was thoroughly versed in the principles of Gothic architecture and had a notable practice as the designer of more than 30 churches in England before he won the commission for Saint Bartholomew’s. In 1841, he designed a Romanesque church for the Herbert family at their Wiltshire estate at Wilton, outside Salisbury. Wyatt also worked closely with Sidney Herbert, younger brother of the Earl of Pembroke, who administered the family estates and donated the site for the “Pembroke District Church.” Sidney Herbert was a brother-in-law of Thomas Vesey (1803-1875), the 3rd Viscount de Vesci, who married Lady Emma, daughter of George Herbert, 11th Earl of Pembroke. Lord de Vesci had commissioned Wyatt to restore Abbeyleix House, Co Laois and design the nearby parish church of Saint Michael and All Angels. Thomas Henry Wyatt had a prolific and distinguished career as an architect. Although he was born in Ireland, he is often regarded as an English, and the Wyatt family included five or six generations of major English architects in the 17th, 18th and 19th centuries. I was reminded once again at the weekend of the Wyatt family’s family roots in and strong links with Lichfield and their links with Pugin. There are several interesting architectural dynasties in the 19th century, including those descended lines from Thomas Hardwick snr, Charles Barry, AWN Pugin and George Gilbert Scott. But the Wyatt family tree goes back much further and the family stands out for the extent and variety of its work. There were Wyatts in Weeford at least as early as 1540, when William Wyatt was the father of Humphrey Wyatt. The village of Weeford is four miles south of Lichfield, close to Toll 4 on the M6. It is mentioned in the Domesday Book and it was one of the five original “prebends” that paid “wax Scot” or “Plough Alms” to Lichfield Cathedral from the beginning of the 12th century. There was a church there for many centuries, and the old registers for Saint Mary’s date back to 1562, and the Wyatt architectural dynasty can be traced back to William Wyatt of Thickbroom, near Weeford, who died in 1572. 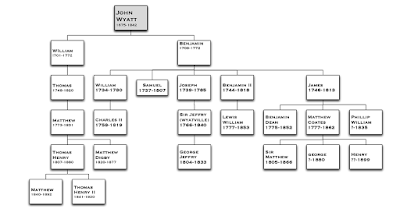 The Wyatt dynasty was consolidated by a great number of marriages between cousins – over 20 in all, eight in one generation alone. Wyatt family members often worked together, making them a force to be reckoned with, particularly in the architectural world of their time. The family also included artists, painters and sculptors too. Edward Wyatt, who was buried in Weeford in 1572, was the great-great-grandfather of Edward Wyatt (1632-1705), whose son, John Wyatt (1675-1742) from Thickbroom in Weeford, was the immediate ancestor of this outstanding architectural dynasty. This John Wyatt was the father of eight sons, the eldest of whom was John Wyatt (1700-1766), an inventor, who was born near Lichfield and was related to Sarah Ford, mother of Dr Samuel Johnson. A carpenter by trade he worked in Birmingham, where he developed a spinning machine that predated Richard Arkwright’s Spinning Jenny. Another of John Wyatt’s eight sons was Benjamin Wyatt (1709-1772), who was the first member of the family to become involved in building work. He was a “farmer, timber merchant, building contractor and sometime architect.” In 1757, he built Swinfen Hall, between Weeford and Lichfield, for Samuel Swinfen and his wife. 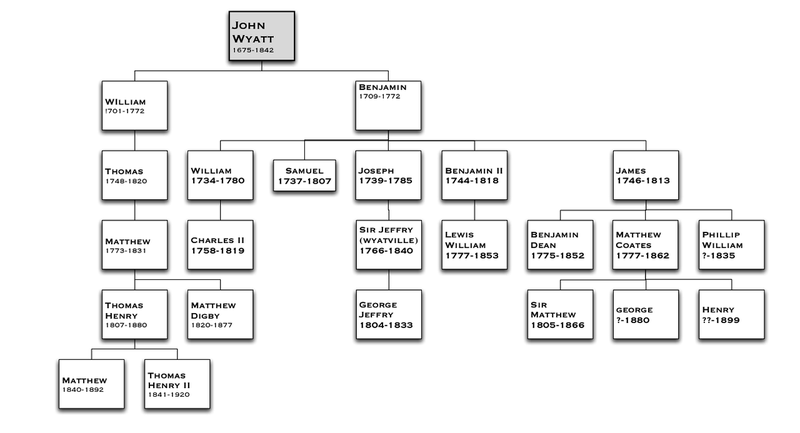 Benjamin Wyatt had a large family. His son Joseph Wyatt (1739-1785), who married his cousin Myrtilla Wyatt, was the father of Sir Jeffry Wyatville (1766-1840). 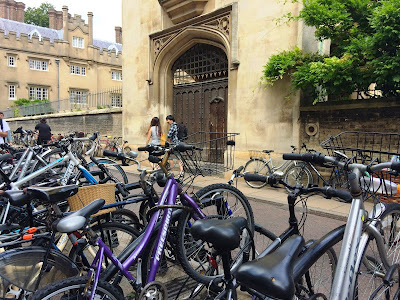 He changed his surname from Wyatt to Wyatville (frequently misspelled Wyattville, as in south Dublin housing estates), and I am aware at first-hand of his alterations to Sidney Sussex College, Cambridge, in 1832, including the gatehouse. Under his supervision, the exterior brick of Sidney Sussex College was covered with a layer of cement, the existing buildings were heightened slightly, and the architectural effect was also heightened. In 1792, he was appointed Surveyor General, which effectively made him England’s most prominent architect. He was also involved in works at Windsor Castle, Kew Gardens, the restoration of the House of Lords and the building of Saint Mary’s Church, Weeford. Saint Mary’s, a Grade 2 listed building, was built in 1802 and James Wyatt donated the altar, the pulpit, the screens, the font and the ornamental furnishings. This James Wyatt was also architect involved in the restoration of Lichfield Cathedral in the 1780s. He oversaw work to remove 500 tons of stone from the nave roof, replacing it with lath and plaster, and effectively saving the cathedral from collapse. James Wyatt’s major neoclassical country houses include Castle Coole, the Enniskillen home of the Earls of Belmore, and Packington Hall near Lichfield, the home of the Levett family for generations. His eldest son and pupil, Benjamin Dean Wyatt (1775-1852), built the Theatre Royal in Drury Lane and was also the Surveyor at Westminster Abbey. Another son was the sculptor Matthew Cotes Wyatt (1777-1862). The brothers of Benjamin Wyatt (1709-1772) included William Wyatt (1701-1772), the grandfather of Matthew Wyatt (1773-1831), who studied law instead of architecture. He moved briefly to Ireland when he was appointed a barrister and police magistrate for Roscommon. Thomas Henry Wyatt (1807-1880) was born at Loughlynn House, Co Roscommon, on 9 May 1807. The Wyatt family returned to England in 1818 when he was about 11, and another famous brother, Sir Matthew Digby Wyatt, was born in Rowde, Wiltshire in 1820. By 1825, the family was living in Lambeth. Thomas Henry Wyatt first began a career as a merchant sailing to the Mediterranean, particularly Malta. But he decided to return to the family’s tradition of architecture, and his early training was in the office of Philip Hardwick. There he worked until 1832, and was involved in work on Goldsmiths Hall, Euston Station and the warehouses at Saint Katharine Docks. He began to practice on his own as an architect in 1832, and in the same year he was appointed District Surveyor for Hackney, a post he held until 1861. He married his first cousin Arabella Montagu Wyatt (1807-1875). She was the second daughter of his uncle, Arthur Wyatt, who was the agent of the Duke of Beaufort. By 1838 he had acquired substantial patronage from the Duke of Beaufort, the Earl of Denbigh and Sidney Herbert (1810-1861). David Brandon joined Wyatt as as partner, and this partnership lasted until 1851. Then in 1860, Wyatt’s son Matthew Wyatt (1840-1892) became his partner in 1860. He lived at and practised from 77 Great Russell Street, London. This practice was extensive with a large amount of work in Wiltshire, thanks to the patronage of the Herbert family, and in Monmouthshire through the Beaufort connection. Wyatt worked in many styles ranging from the Italianate of Wilton through to the Gothic of many of his churches. Sidney Herbert, who had sent Florence Nightingale out to Scutari, was the father-in-law of both the theologian Friedrich von Hügel and the composer Hubert Parry. He lived at Mount Merrion and was managing the Pembroke estates when the site for Saint Bartholomew’s Church was donated and Wyatt was commissioned to design the new church. 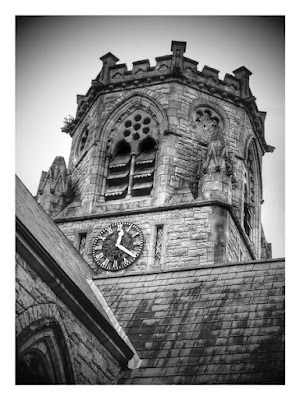 Apart from Saint Bartholomew’s Church, Ballsbridge, his work in Ireland includes the Church of Saint Michael and All Angels, the Church of Ireland parish church in Abbeyleix, Co Laois, and he enlarged and altered Saint Mary’s, the Church of Ireland parish church in Gowran, Co Kilkenny. He also reported on the completion of the restoration of Saint Canice’s Cathedral, Kilkenny. He also worked on several country houses in Ireland, including Abbey Leix, Co Laois, for Lord de Vesci, Ramsfort, Co Wexford, for the Ram family, Lissadell, Co Sligo, for the Gore-Booth family, and Palmerstown House, Co Kildare for the de Burgh family. The font in Saint Bartholomew’s Church was a personal gift to the church by Thomas Henry Wyatt. He died on 5 August 1880 leaving an estate of £30,000, and is buried at Weston Patrick. His younger brother and former pupil, Sir Matthew Digby Wyatt (1820-1877), was an art historian and the first Slade Professor of Fine Art at Cambridge. More recent members of the Wyatt family who are remembered in Saint Mary’s Church, Weeford, include the former amateur cricketer and captain of Warwickshire, Worcestershire and England, Robert Elliott Storey (Bob) Wyatt (1901-1995), and the politician, journalist and chairman of the Tote, Woodrow Wyatt (1918-1997), who was Lord Wyatt of Weeford by Margaret Thatcher and who is also buried in the churchyard.